Tires may be black, but some are also “green.” “Green” is a label currently used for tires designed to improve fuel economy however these low rolling resistance tires have a reputation for providing a firmer ride and inferior handling, performance and grip. Pirelli is about to change that perception with the introduction of their new Scorpion Verde tire. The Scorpion Verde is designed specifically for SUV’s, crossovers and light trucks. There are four icons moulded into the sidewall of the tire that help consumers recognize it as a green tire. The first icon is a gas pump, representing fuel economy savings. 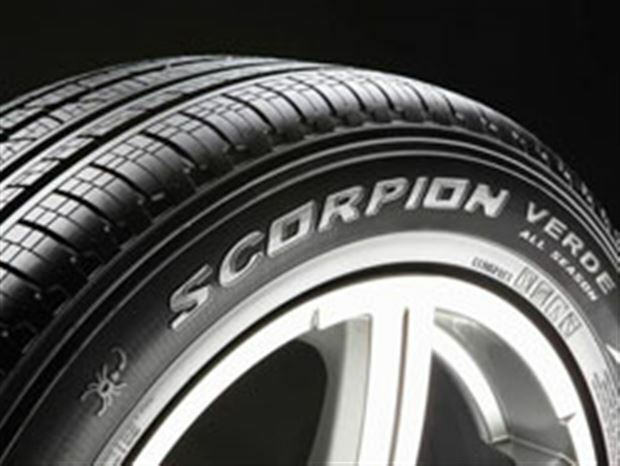 A lighter tire is easier to get rolling and the Scorpion Verde is eight per cent lighter than a conventional tire. To reduce weight, the Scorpion Verde uses a special belt design where materials are reduced in non-critical areas but narrow bands are added under the tread on the outside corners. This gives the tire the same strength but less weight. The end results are a tire that will improve fuel economy by 3.9 per cent in city driving and 3.2 per cent at a constant 90 km/h. Less fuel consumed also means less CO2 emissions out the tailpipe. As well, additional reinforcement in the tire sidewalls and the squared off bead area maintain the tire’s stability during transitions and hard cornering – most tires have a round bead area that allows the tire sidewall to roll or flex easier under side loads, so the Pirelli design really helps with handling and performance. The second icon on the sidewall is a leaf, which represents Pirelli’s environmental consciousness. The Scorpion Verde uses about eight per cent less raw materials during manufacturing and even these materials are more environmentally friendly. Oils used in the rubber are synthetic products instead of conventional hydrocarbon-based oils. Silica is used instead of carbon black in the rubber compound, a material usually thought of as part of winter tire construction. The leaf also represents Pirelli’s reduced environmental impact. They have reduced water consumption by 12.7 per cent, energy consumption by 9.2 per cent, CO2 emissions by 8.9 per cent and NOX emissions by 14.9 per cent overall at their facilities around the world. This commitment has enabled them to lead their sector in the Dow Jones Sustainability index with a rating of 88, compared to an average for all tire companies of only 48. The third icon on the sidewall is a road, representing improved treadwear. One of the keys to improving treadwear is keeping the tire contact patch on the ground as square as possible at all speeds. Belt and cord design helps, as does the tread design. Most drivers are not aware that at highway speeds just above 100 km/h, even a well designed tire will only have about 55 per cent of the tread in contact with the road compared to when the vehicle is stopped. Think of how the tires change shape on a top fuel dragster as it accelerates — this happens to passenger tires too, albeit in a far less dramatic fashion. The better the tire construction is at keeping the tire evenly contacting the ground, the better the tread wear will be. Tread design also improves wear, by providing as much rubber contact area as possible. Street tires have to deal with dirt, snow, and water, so voids or grooves are placed in the tread so the rubber can contact the road, while the water and snow move to the grooves. Silica combined in the rubber does make it more flexible, just as it does in winter tires, but silica also wears well. Tire rubber compounds are highly guarded secrets, but Pirelli has managed to incorporate superior grip with good tread wear in the same tire. However, the biggest factors to tread wear are driving style and tire pressures, so drivers play an important role too. The final icon is a music note with a bar across it. This represents low noise level both inside the vehicle and outside. Tread design is critical to both of these. Anyone who has lived beside a busy street will appreciate lower tire noise, as will occupants of vehicles on a long drive. Green is more than just a state of mind. It is about making choices that will affect our future. Some say it is better not to drive, but that isn’t an option for others. Choosing a green tire that provides handling, performance and fuel economy looks like a smart choice.